It’s okay not to be a missionary, mystic, or theologian. That’s one message Christian History would like to communicate with this issue. Church history is littered with theologians, from Athanasius to Augustine to Luther to Edwards. Our history is also filled with missionaries (from Patrick to Jim Elliot) and “mystics” (the super spiritual like Francis and Count Zinzendorf). If you’re going to make it into the history books, it seems, you’d better fit into this triad of callings. But Livingstone doesn’t. Not that historians haven’t tried to make him fit. Early biographies, and even Livingstone himself, tried to pin “missionary” on his lapel. He started out as a missionary, certainly. But he converted only one African his entire life, and that convert reverted to paganism. He established no hospitals, nor did he translate the Bible into a foreign tongue. Some missionary. But he is famous for his explorations, which admittedly were partly motivated by cross-cultural compassion: he sought the end of African slavery. Yet it was his extraordinary discoveries (Lake Ngami, Victoria Falls) and his extraordinary courage (some would say recklessness) that left an indelible impression on the British public. And that’s good enough for us, which is why we call Livingstone an explorer. We’re happy to add “missionary” to his moniker because of his early career and motives. But let the emphasis fall on explorer. We’re saying that all manner of people with all manner of callings have made significant contributions to our Christian heritage. With this issue Ted Olsen joins the Christian History staff as assistant editor. 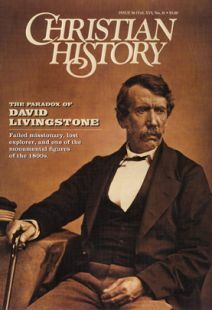 He wrote “The Other Livingstone” (page 32) as a free-lancer, but once on staff, he kept coming up with great ideas, so we let him add “The Evil that Baffled Reformers” (page 24) and “Finding a Useful Wife” (page 31) to this issue’s contributions. Ted was raised all over the place: Maryland, Phoenix, Hawaii, Seattle, Denver. He managed to settle into Wheaton College for four years to earn a B. A. in political science and communications. Most recently he was an editorial resident in the news department of Christianity Today, our sister publication. Ted has an eye for fascinating detail and a hand that composes engaging prose. I’d say we look forward to his contributions, but he’s already made the magazine better!